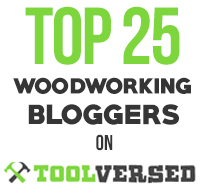 Readers of this blog know of my fondness for the bandsaw. More than almost any other tool in the shop, a fine quality bandsaw allows you to upgrade your range of designs and unlock the wonders of wood. With that in mind, here is my favorite bandsaw blade – the one that is almost always on my 16″ Minimax: the Supercut Premium Gold 1/2″, 3 tpi. The band is .025″ and the alternate set, aggressive hook teeth produce a kerf of about .044″, or slightly less than 3/64″. 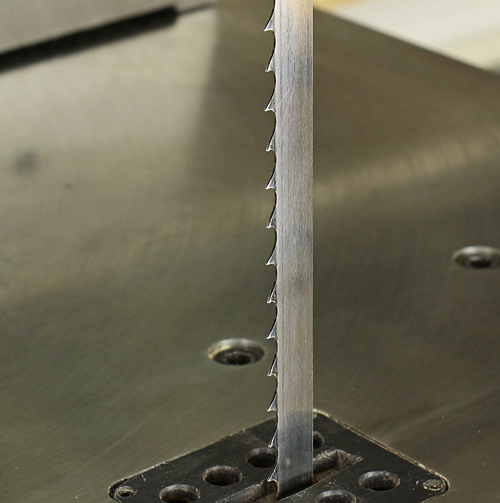 Here’s the big deal about this blade: the teeth are carbide impregnated, which keeps them sharp vastly longer than those of conventional carbon or silicon steel blades. I have used this blade for years, feeding it thousands of feet of everything from dense exotic species to knotty construction lumber, and it remains quite serviceably sharp. Only that it is no longer as crazy sharp as it used to be, has me now wanting to replace it at the very reasonable price of about $31 for 143″. Now, a 1/2″ blade may not suit much of your work, but it’s just what I need for the gradual curves characteristic of my work. Its nominal minimum circle diameter is 3 5/8″. What’s more, this blade resaws fast and true all the way up to the 12″ capacity of my saw – no blade changing needed. Virtually every project I make involves these two processes. The hook teeth with this amount of set should not be expected to produce a surface ready for gluing laminates or thick veneer, but with a well-tuned bandsaw, the surfaces do not require a lot of clean up. I’ll go to other options if I really need an excellent surface directly off the saw. All of the manufacturing details are excellent, including the weld, and especially the outstanding sharpness. Supercut Premium Gold blades also come in 1/4″ 6 tpi hook and 3/8″ 4 tpi hook. The blades are made by a family-owned company in northern Idaho, the kind of small business I like to support. Supercut also makes an extensive line of other bandsaw blades and accessories. They will provide personal attention to your order on the phone. As usual here, this review is unsolicited and uncompensated. I just really want you to use excellent tools made by good companies so you can make great stuff! Thanks for the info Rob! I’m looking looking for a better blade. Thanks yet again for sharing another tool review / information ! Do you order from the manufacturer directly ? Or, if not, can you please pass along a local distributor where they can be found locally ( near us that is )? You can order from them directly. They have distributors but I don’t know specifics. Thank you very much for the information. I recently purchased a Minimax MM16. I have had experience on other bandsaw but have never owned one. Can you tell me if you used a blade tensioner gauge. The one shortcoming that I have found with my saw is a sort of blade tension guide that seems completely inadequate. I do not use a blade tension gauge. The right blade tension is ultimately determined by the cutting performance. An under-tensioned blade will produce a curved cut top to bottom, sometimes called “barreling,” especially noticeable in a cut several inches in height. An over-tensioned blade is liable to stress the frame and/or tension spring. Certainly, never fully compress the tension spring – not even close! That would remove any compensatory flexibility in the system. So, somewhere in between those limits is a range of good functional tension. Start off by tracking the blade and gradually increasing the tension (saw unplugged) until it deflects only perhaps ¼” over one foot with a firm press of your finger in the middle of that span. Observe the performance of your saw and adjust from there. Add some reference marks somewhere on the tension system so you know where to start for a given blade for next time. Put a reminder around the blade after you release the tension when the work is done (I use a little velcro strip) so you won’t make the annoying mistake of starting up your saw with a loose blade. Enjoy your bandsaw. Lmk how it works out for you. 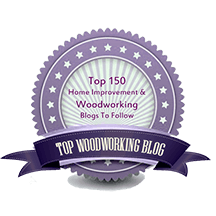 « What is a fundamental skill set for a woodworker?